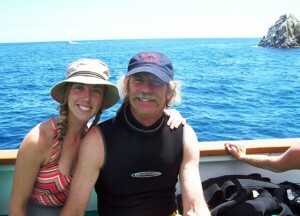 Among the world’s first SCUBA instructors, Bill Finstad began introducing divers to our underwater world in 1972. Finstad’s Scubaventures opened its doors on the Santa Cruz Harbor-front, beside Jack O’Neill selling wetsuits and offering dive travel packages. This was the golden age of SCUBA; there were incredible possibilities for adventure, healthy ecosystems, and fewer rules and regulations! After selling Scubaventures, the business began to rely on word of mouth and referrals. Youngsters, remember this was before the internet and cordless phone. Being successful in this form was quite an achievement. 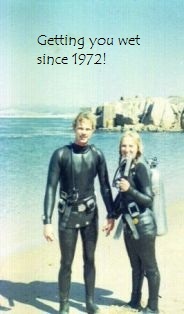 In the 1990s Scubaventures became Finstad’s Worldwide Diving Adventures, operated by Bill and Cindy Finstad. Together they instructed thousands of students and chartered approximately twenty liveaboards annually. When Bill started feeling the call of the wild, err, I mean retirement, his daughter Kristy took the torch. Bill’s fins are too big for anyone to fill, but Kristy naturally swims in the same current. In 2004, she became a NAUI instructor and her husband Dan Chua got his US Coast Guard Captain’s license. Sarah, Kristy’s sister, and her husband Jim have also stepped into leadership roles. It’s a family affair! We organize three to five international dive vacations and five to six Channel Islands get-aways annually; offering certification courses by demand. Welcome to the family!